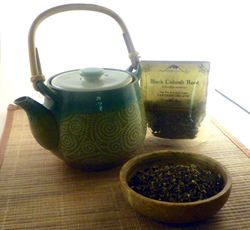 Black cohosh can be brewed to make a bitter, dark tea that has a wide range of benefits. It has estrogen-like properties that help to regulate hormones important to women's health. Helpful in menopause,PMS and regulating menstrual cycles. Black cohosh also acts as a nervine, giving relief to headaches, pain and muscle spasms. Recipe Instructions: Decoction :Use the finely chopped roots to make the a decoction. Amenorrhea :Amenorrhea, the medical term for the loss of periods in women who should be having regular periods, is a sign that something in the body has gone wrong.